Mam Cymru. The Mother of Wales. Ynys Mon. Anglesey. The north-west island of Wales. Further to the north is Holyhead and the ferry across The Crack to Ireland in the west. 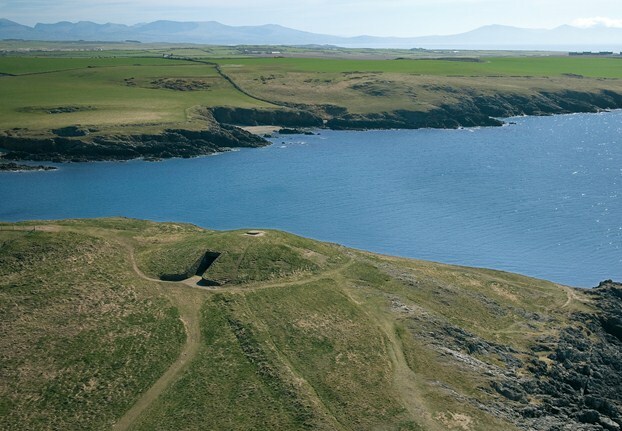 On a beautiful windswept headland between Aberffraw and Holy Island sits the remarkable dome of Barclodiad y Gawres (The Giantess’ Apron), somewhat ruined in 1952-53 when the chamber was re-roofed with concrete and covered in turf to resemble the original structure. Vandalism! In fact vandalism has been a recent feature of this site, so much so that one now has to apply for a key from a local shop to visit (accompanied) the stones inside the chamber. A metal gate bars the entrance to the stones. These stones are marked with spirals, zig-zag cupmarks dating around 2300-2400BC. The Mound is entered from the north side and the diameter of the chamber is 6m. During excavations a fireplace was discovered containing remnants of fish, frogs, toads, snake, mouse and hare suggesting quite a stew or a ritual concoction. The Mound with its stones is situated on the north side of Porth Trecastell (Cable Bay) so called because the Atlantic communications cable came ashore here, the one linking to Howth in Ireland in 1870, recently uncovered on the beach in a local storm. It is well worth visiting this Neolithic burial chamber; there is a small car park for the beach and a short walk to the headland with often dramatic waves breaking on the rocks.